The stresses of air travel can unnerve even the most laid-back adventurer. But for families who have children with autism and/or other intellectual and developmental disabilities, the trip to and through the airport can be just too difficult to even consider. That's why Latonya Bingham’s family has only ever taken vacations to places they can reach by car, sometimes leaving the house at 2 a.m. when the roads are calm and quiet. And it’s also why Bingham and Matthias, her 4-year-old son who has sensory issues associated with autism, are attending an air travel ‘rehearsal’ at Hartsfield-Jackson Atlanta International Airport on Wednesday. The program allows families to practice going to the airport, passing through security, waiting in the gate area and getting onto a plane — without the cost and commitment of a plane ticket — and is coordinated by The Arc, a Washington, D.C. organization that has hosted 75 similar events at more than 40 airports around the country. The chance to do an airport test run definitely made a difference for Katy Guerra’s son Danny, a 10-year-old with autism who doesn’t do well with change or fast-paced environments. The military family is used to moving but has never had the opportunity to move together as a family overseas. But after going through one of The Arc’s Wings for Autism programs, (also known as Wings for All) and spending two months preparing, Danny took his first plane ride: a 14-hour flight to Seoul, South Korea. Test runs like this not only give families a chance to see how a child with a special need will react to the airport experience, they give airport, airline and TSA employees a chance to learn and practice how to interact with children and adults who have autism and/or other intellectual and developmental disabilities as well. 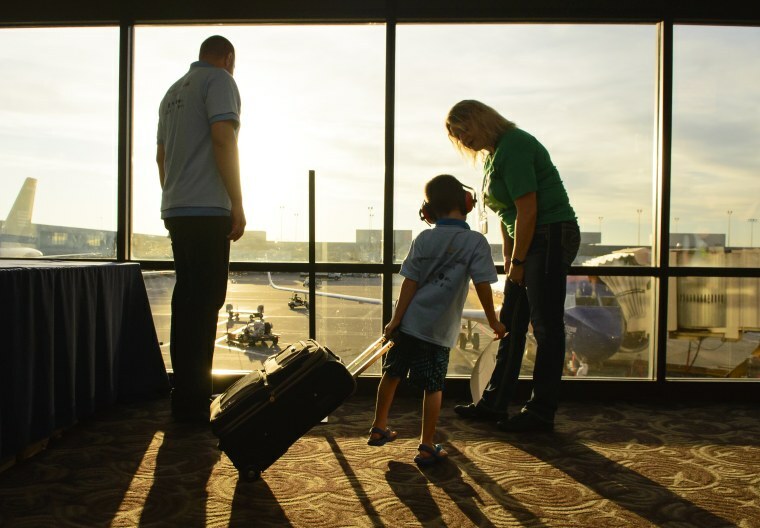 At the Wings for Autism events, TSA officers and managers "ask families for recommendations on how to best work with them as well as answer their questions about TSA requirements," TSA spokeswoman Lisa Farbstein told NBC News. Creating autism-accommodating airports and, beyond that, autism-friendly communities may be a trend. In April 2016 Delta Air Lines opened a quiet, multisensory room at the Atlanta airport with a mini ball pit, bubbling water sculpture, tactile activity panel and other items to help ease the airport experience for customers traveling with children on the autism spectrum. Myrtle Beach International Airport in South Carolina opened a “quiet room” for people with special needs not long after, and this month, Europe’s first airport sensory room for passengers with autism opened at Ireland’s Shannon Airport. In the tourism-focused Myrtle Beach area “autism-friendly” goes beyond the airport. The new $3.2 million ADA-approved Savannah’s Playground has special sensory-friendly features, there’s a quiet room for people with autism at the Myrtle Beach Speedway and, with a special card secured online or in-town locations, families can secure special accommodations for a child with autism at area attractions, hotels and restaurants where staff has been specially trained. And to make sure potential visitors know the community gets that traveling with kids who have autism can be especially chaotic and unpredictable, in January, 2016 the town council in Surfside Beach, on the southern end of the Myrtle Beach, signed a proclamation declaring the area to be the first official autism-friendly travel destination.